And like it the small audience certainly did, joining in with the fun from the get-go. I mean there was a Conga-Line winding around the theatre within the first few songs. Leading the merriment was a band assembled from leading Durban musicians. Dillan Kenny is on drums, Lloyd de Gier on bass, Shemuel Mahabeer on keyboard and ex Tree 63 frontman John Ellis on guitar. Providing the vocals are Kieran Rennie (he is also the MC) from Johannesburg, Jéan Citto from Cape Town, Aimee Rain from Pretoria and two Durban girls, Christina Jenkins and Jemma Kate Badenhorst. John Ellis also weighs in with a few songs, while both he and de Gier provide back-up vocals. 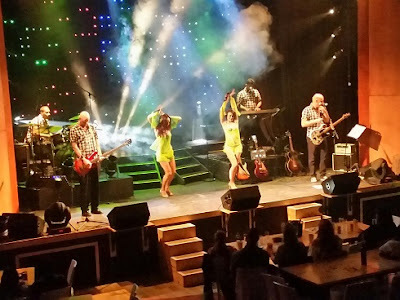 This team takes the audience on a wild roller coaster ride around the world performing popular music from many countries – proving that wherever you go in the world you can find exciting, up-tempo rock music. The tour starts in Australia with Midnight Oil’s Beds Are Burning followed pop princess, Kylie Minogue’s The Locomotion (the cause of the Conga-Line) and then AC/DC’s All Night Long. Next stop was India with Mundian te bach ke by Panjabi MC and Jai Ho from the movie Slumdog Millionaire. This segment included some comic Bollywood dance by the cast. A visit to Europe included songs from Sweden’s Abba and Roxette, France’s The Gypsy Kings, Norway’s A-Ha and Germany’s Boney M, while Spain’s Macarena had the audience on their feet dancing the funky dance steps. The visit to England resulted in Police’s Every Breath You Take well performed by John Ellis, Queen’s Bohemian Rhapsody featuring the whole cast and Adele’s Someone Like You. The Jamaican leg of the tour led to the highlight of the show with Jéan Citto doing Bob Marley’s One Love and Three Little Birds. Then from America we heard the music of Michael Jackson, Katie Perry, Miley Cyrus and Ricky Martin. The tour also visits Mexico (Carlos Santana) and Colombia (Sharika) before ending in South Africa with the music of Freshly Ground, Brenda Fassie, Mandoza and PJ Powers – proving that we can stand tall in the world of rock music. Last night, sitting for the first time on one of the balconies at this venue, I found the sound to be rather muddy and the Rockwood’s impressive lighting rig a bit static. However, by their reaction the audience loved the show and had a good time. To borrow the lyrics from the Status Quo song again I would say that their opinion was:- I like it, I like it, I like it, I like it - I li-li-like it, li-li-like it. A Rocking World Tour runs until November 4, 2018, at Rockwood Theatre, Sibaya, with shows at 20h00, Thursday to Saturday, and 14h00 on Sundays. Tickets cost R99 per person (Thursday) and R130 per person (Friday to Sunday). Pensioners get 50% off the ticket price on Sundays and children under 12 enter for free. Bookings at the Sibaya Box office, at www.rockwoodtheatre.co.za. or call 0311610000.